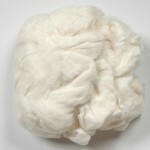 50g bags of pure, smooth cotton slivers for spinning, paper making and hurdy gurdy players. These are pure cotton slivers (or tops) that have been combed to create a glossy, smooth and strong appearance. They have the longest staple of all cotton fibres and are smooth, soft and strong. Spin the fibre on its own to create strong, soft and smooth yarns ready to knit, crochet or weave. Blend the slivers with other fibres to create a textured effect. 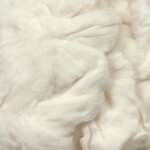 Cotton won’t felt as it is, but can be carded with other fibres (such as merino wool) to allow felting to occur. However, it is perfect for needlefelting onto a pre-made background and blending with other fibres to create silk paper. Cotton fibres are the ultimate fibre for making traditional handmade paper using a deckle and mould to create a smooth, strong, white surface. These white fibres will dye easily with cold water dyes, whether before transforming them into something else of afterwards. Are you a Hurdy Gurdy musician? This is the fibre you want, although it might last you rather a long time, so why not share a bag with a friend? It's a lovely quality fibre, with lots of versatility and at a great price.